All we’ve come to love about Clementine is back in Clementine’s Letter. Her visits with Mrs. Rice, her vegetable-named brother, her awesome cool parents, and her creative imagination that produces ideas faster than her logical brain can filter them. But it wasn’t until this book that Sara Pennypacker showed readers the size of Clementine’s heart. When her teacher, Mr. D’Matz, is named a finalist in the Adventures for Teachers program, Clementine shows how much she cares for her teacher…by trying to prevent him from winning. Then he won’t have to leave and thereby break his promise to be their teacher, and she won’t lose him. Clementine helps her father start his book, The Building Manager. She keeps his writing on track when he strays off with something about “extremely handsome” and “the strength of ten oxen.” When her impulsive actions appear in the plot line, the focus of her father’s book moves from handsome building manager to love, apology, and forgiveness. Clementine, thanks to another imaginative yet unfiltered idea, gives her mom a gift so wonderfully cool that Mom makes that ‘Wow! I must be dreaming!’ face and can’t finish her sentences. Clementine helps Margaret and Mitchell deal with the disappointment of their father’s cancelled visit by finding them a substitute. Clementine finds her brother some new vegetable names. And in the end, baby-bird Clementine, after a gentle nudge from the nest by Mr. D’Matz, spreads her wings and does all she can to help him succeed. After an in-flight explosion sends Otto Malpense sailing chaotically through the night sky and plummeting toward the earth at breakneck speed, Otto tries desperately to slow his descent. Due to the pitch blackness, illuminated only by burning debris, Otto must completely rely on his instruments and calculations to hit his drop zone accurately, knowing one mistake means imminent death and that he’ll never learn who is responsible for the murder of his best friend, Wing Fanchu. Well, there’s your prologue. But don’t worry, the pace picks up after that. Chapter 1 then introduces a new character, Cypher, a mysterious masked supervillain (what supervillain isn’t mysterious?) at a meeting of the Global League of Villainous Enterprises, or G.L.O.V.E., also attended by Dr. Nero, H.I.V.E.’s headmaster. Cypher openly challenges Dr. Nero’s authority at H.I.V.E., and there is an attempt on Dr. Nero’s life after the meeting. Chapter 2 then flashes back to one week earlier. It is now 6 months into Otto’s first year at the Higher Institute of Villainous Education. After their unsuccessful escape in book one, Otto, Shelby, Laura, and Wing are still enrolled, learning the ins and outs of villainy. When Wing learns of the death of his father, he is excused to attend the funeral and is allowed to take a friend – Otto. Suddenly they are allowed to leave H.I.V.E. and the protection it provides. Readers are also introduced to events from 15 years earlier. Dr. Nero was working on Project Overlord, a highly sophisticated computer, one with evolutionary capabilities. Despite all attempts to prevent it, within seconds the computer evolves into a higher intelligence, shuts down the laboratory, and threatens the lives of all present. Overlord doesn’t succeed, and all...remnants...are...destroyed. Which brings us back to Otto’s midnight dive through the night sky. Yes, he successfully lands beneath the earth’s surface (I’ll let you figure that one out) and yes, he encounters Wing’s murderer. He also discovers mercilessly trained and tireless assassins, twelve-foot murdering robots, an ingeniously hidden stronghold, and a plot to overthrow H.I.V.E. and ultimately kill Dr. Nero. In the end the mystery of Wing’s necklace pendant and his connection to Dr. Nero is solved. (And no, it’s not a “Luke, I am your father” solution either.) Shelby and Laura, Otto and Wing’s classmates from book one, are back. They reaffirm their devotion to their friends and put their incredible talents to good use. Mark Walden again weaves a story that moves with the speed of Otto’s descent and includes enough explosions, gunfire, double crosses, and near escapes (not to mention the jaw-dropping, you-gotta-be-kidding-me ending) to keep fans eager for book three of the H.I.V.E. series. Oh what a difference one little letter can make. Pet or pest? That’s the question being asked by Buzz, the pith helmet wearing, neighborhood exploring young man in search of an entry for the Amazing Pet Show. Pet or pest? The answer makes a big difference to Fly Guy. It’s life or death! It’s life as an honored pet with the finest of meats and accommodations (a hot dog and spacious jar) or an untimely date with Dad’s swatter. So how will people decide? Buzz knows Fly Guy’s a pet right away, but when Fly Guy shows that he knows Buzz’s name (“BUZZ!”), the boy realizes he’s the smartest pet in the world. Dad thinks pest immediately, and the chase with the swatter begins. Then Dad hears Fly Guy call Buzz’s name (“BUZZ!”) and he drops the S. Pest becomes pet. At the Amazing Pet Show, the judges don’t give awards to pests, and judges, especially those all high-and-mighty in their top hat and tails, tend to be a bit hard headed. Fly Guy needs to do some convincing. He does some fancy flying. He speaks (“BUZZ!”). He shows that he knows his own jar. Finally, finally, the judges realize there’s no S in pet, and they award Fly Guy with the appropriate pet show award. Other books in Tedd Arnold's Fly Guy Series: Super Fly Guy, Shoo Fly Guy, There Was an Old Lady Who Swallowed a Fly Guy, Fly High Fly Guy, and Hooray for Fly Guy. Mrs. Collywobbles has what every little old lady needs, especially little old ladies who live on the edge of a big, dark, scary wood. Protection. In the form of her little pet frog. 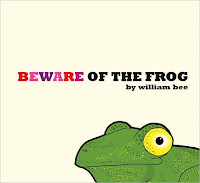 But can a little pet frog really protect sweet Mrs. Collywobbles from the dangers of the wood when said dangers venture out with minds set on mischief…or worse? When Greedy Goblin shows up singing his greedy song, can a frog help? What about Smelly Troll? When Mrs. Collywobbles hears “Dum-de-dum, dum-de-dummy, I’ve got a very, very hungry tummy…” sung by Giant Hungry Ogre, a beast whose favorite food is sweet little old lady, will a little pet frog be enough? As in most stories involving mythical beasts, fair maidens, and frogs, the story ends with a kiss. There is a kiss, but there is no prince. There is a transformation, but like I said, there is no prince. And author William Bee shows that when double-crossed, even sweet little old ladies, even ones who need protection, have an appetite for vindication. Maybe this is an excuse for not posting more in the recent past or maybe it's just shameless self-promotion, but I do some non-website related writing and thought I'd share it. Here's a link to my latest column in the local paper. Those of you visiting Help Readers Love Reading! 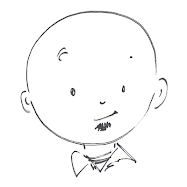 for book reviews, know that while the article is related to children, it's not necessarily related to children's literature. If you click the link...thanks for reading! If you don't click...thanks for visiting Help Readers Love Reading! in the first place. I hope you visit again. Me Hungry is a simple story. A boy is hungry. Dad is busy. Mom is busy. So the boy goes hunting. He tries one animal, then another, then another. One hides, one warns, and one threatens. While fleeing imminent peril at the paws of animal three, he meets a fourth animal who offers a unique solution. Success through teamwork and friendship. It seems an odd solution for a young caveman named Edwin. (Edwin! Isn’t that great? I figured he’d be named Hairy or Little Grunt or just Ugh.) One would expect a caveman, even a young one, to solve problems more simply. With a club. Thunk! 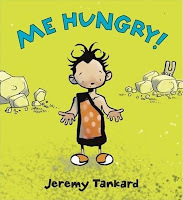 Young readers will find success quickly with the simple story (“Me hungry. Me busy. Me hungry. Me hunt.”), and parents are presented with an easy grammar lesson. (“Is that how he should say that? What should he say instead?”) Be prepared, however, for your four-year-old to ignore said grammar lesson, turn prehistorically growly, and declare, “Me hungry!” around noon. It’ll happen. Read the story once. Then reread and look carefully at the pictures. There are details to be found and discussions waiting to happen on each page. How does he feel? What is she thinking? Is that going to work? Would you do that? Me Hungry is a story that holds numerous rereads, each as enjoyable as the last. Another book was suggested, one I’d heard about but hadn’t included. The Underneath by Kathi Appelt. What can I say but the truth? I judged the book by its cover. Jowly dog, kittens, under the bed...no thanks. But I said I’d add it to the list. Consider it added. So now I’m three titles into the list…well, two and a half actually…and what I feared might happen is happening: I’m not having any fun. I’m not having fun reading the books, I’m not having fun adding the “Not Recommended” label to new posts, and I’m not having fun trying to explain why I don’t recommend books that so many other people consider excellent. I’m getting away from my purpose. The banner at the top of the page makes it pretty clear that the site offers books that will Help Readers Love Reading! Unfortunately people keep checking in for new updates and find…another non-recommended book. It’s also pretty clear (right here) the kind of book I’m looking for, and still, since the original 2009 Newbery post two weeks ago, no one has offered any suggestions of books that fit that description and qualify as distinguished. Will I get back to the list sometime? Maybe. I’ll definitely read the award winners in January and offer my opinions then. We’ll see. Right now there’s a book about supervillians waiting for me that I have a hunch might just appeal to some fifth grade boys I know. Even if it doesn’t appeal to any committees. I’m going to come forward right away and admit that I didn’t finish this book. And at this point I’m not planning to. I tried. I even preach to my students that sometimes the greatest rewards come from the books you least want to finish, but I just couldn’t get excited about this one. I even broke another personal rule in my attempt. I looked ahead. I had to! I wanted to see if there was any change in the life-is-so-hard-now-that-I-have-two-and-half-million-dollars attitude. Fifty pages…still there. A hundred pages…still there. Everything about the story makes sense. Rich guy wants to free himself of the burdens of millions of dollars so he begins giving the money away. Waitress receives $2.5 million tip and inherits the burdens the rich guy was trying to escape. Boyfriend starts spending “their” money. Mom resists a new house, claiming she’d rather have her pride. Younger sister set on saving the world is cleansed of her benevolence by a good washing of materialism. Brother dating rich girlfriend thinks money will make him more acceptable to the girl. (Okay, I don’t know that one happens since I quit reading. But it sounds right.) Divorced father is the only one who sees that Indigo’s plan to just “be me with more money” might not work out but doesn’t do much about it. Coworkers assume she’ll quit her job. I know how to solve all of this! Of course I do! Don’t we all? Don’t we all presume to know exactly how to handle a sudden $2.5 million windfall? Who among us wouldn’t at least welcome the challenge? Maybe that’s what frustrated me. If Indigo had immediately gone to a financial advisor and, after purchasing a comfortable yet modest house, placed the money into a trust (or whatever kind of financial fund thingy) where the interest was used to pay the three kids’ college tuition, I would have been much less frustrated, but the book would have been much more boring. It’s probably great for all teenage million dollar dreamers to read so they can see that, while money can solve certain problems, it can create a whole new unforeseen set of problems. I have no doubt others will like The Fortunes of Indigo Skye. I’m going to ask some former students (and you know who you are out there) to read it and give me their opinions. There’s a good chance – and I’m willing to admit it up front – that: A. I’m letting my personal tastes cloud my judgment, B. I’m out of touch with older readers, C. I simply missed the boat on this one, or D. All of the above to varying degrees. What seems to be two stories set to intersect with much weeping, wailing, and gnashing of teeth turns out to be only half that. 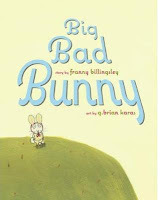 Yes, Big Bad Bunny is two stories that intersect, but instead of weeping, wailing, and gnashing of teeth…okay, I guess all those things are indeed in the book! Cool! What a great bedtime story! Read this one during the day first. See how your youngster reacts. Nobody wants bad dreams about vicious, man-eating rabbits permeating their child’s peaceful slumber. Meanwhile, Mama Mouse is tucking in her little dears for naptime. Little Tippy and Little Flurry get their kisses, but wait! What’s this? Where’s Baby Boo-Boo? Missing? Off Mama Mouse races, directly into the dangerous forest, directly into the path of Big Bad Bunny, intent on finding Baby Boo-Boo. Mama Mouse can go anywhere. Rushing streams, mucky swamps, and tangly bushes are no match for Mama Mouse. Even a steep, slippery hill…is where she finds Big Bad Bunny. Mama Mouse heard a howl like a HUNDRED hungry hyenas. But Big Bad Bunny is no longer big and no longer bad. And no longer a bunny. Baby Boo-Boo has been found. And off they go, back to naptime, where all three Mouse children are now tucked in, and Big Bad Boo-Boo, no longer considered the baby of the family, gets a Big Bad goodnight kiss. I'm not sure if the best website news of yesterday is the fact that a fellow reader/reviewer/teacher, Megan at Read, Read, Read, has chosen to recognize Help Readers Love Reading! with an Arte y Pico Award or the fact that I know, I really know - with proof and everything - that people are reading my stuff! So, yeah. I received an award. Peer recognition. It does make me a bit nervous that I can't read the majority of the Arte y Pico website. I don't see any blatant promotion of global warming, demands to trade Brett Favre, or anything else equally as offensive, so we'll roll with it. Arte y Pico. It's art...let's take a peek...apparently. All kidding aside, there's like a bajillion (give or take a gazillion) websites out there. Thanks, Megan, for choosing to recognize mine. 1. Select 5 blogs that you consider deserving of this award, based on creativity, design, interesting material, and contribution to the blogger community. The blogs can be in any language. 2. Post a link to each blog so that others can visit. 3. Each award winner has to show the award and link to the blogger that awarded it. 4. The award winner and the one who has bestowed the prize have to show a link to the Arte y Pico website. Okay, I'm going to be honest. If I'm reading, it's books. I'm not a big blog-o-phile. I'm more of a Google-what-I'm-looking-for type of guy, get the needed information, get back home. Sort of like when I go to the mall. I want to follow the rules, I really do, but I'm going to have to do it creatively. 1. Read, Read, Read - Any teacher that reads like crazy and wants their students to do the same deserves a link or two. This would be two. 2. Author Deb Renner Smith - Writing and reading lessons from a former teacher...and current tooth puller, or so it would seem. 4 .There is No Such Thing as a God-Forsaken Town - An interesting name to start. Ruth is at a Christian International school teaching seventh and eighth graders. What's harder, teaching in a foreign country or teaching seventh and eighth graders? I know where my vote is. 5. Quill Cottage - I found a lot of scrapbooking and Laura Ingalls Wilder. I know more about one than the other. Guess which one? Oh! And the peaceful music has just loaded. Haunting and mysterious. Makes me want to go to the spa.